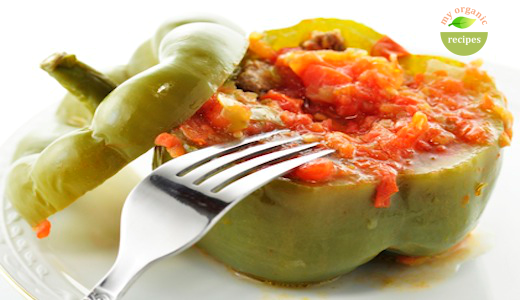 Organic green peppers are stuffed with a mixture of onion, carrots, rice, organic ground beef, dill and tomato paste then baked in the oven. Easy and excellent organic recipe. 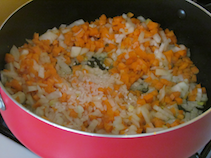 On medium heat, add 1 tablespoon of oil and saute the onion and the carrots in an nonstick skillet for 6 minutes. Add rice and cook for another 6 minutes. 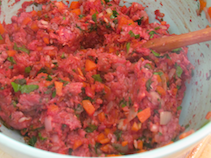 Place the rice mixture over the meat , add dill, tomato paste, salt , pepper and mix until all the ingredients combine. 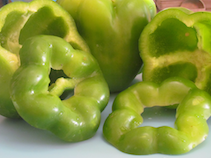 Cut a slice off the top of each pepper. Cut out core, remove seeds and white membrane. 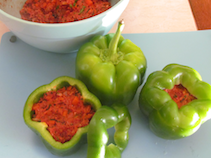 Spoon meat mixture into organic green peppers and stand them up in a oven prof big pot with cover. 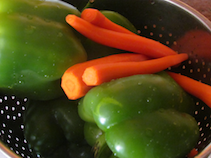 Pour over peppers water to cover with 1 tablespoon olive oil, salt, diced tomato, bay leaves, black pepper and cover. 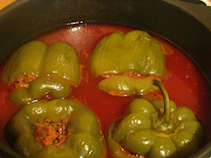 Preheat oven to 375 and bake the peppers for 1 hour or so, until the peppers are cooked. I don’t understand a few things. How much water? It says “Pour over peppers water with 1 tablespoon olive oil”. 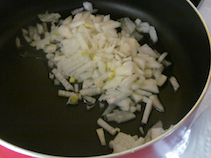 Next thing is do you use 1 tablespoon olive oil in the frying pan with the onions and carrots? Just trying to figure it out. And last thing is do you precook the rice?